The HELIX 7 CHIRP Mega SI GPS G3 is one of the new units released by Humminbird in 2019. It offers three types of sonar including Mega modes for Down Imaging and Side Imaging and includes the new MSI transducer, and for navigation, it has GPS and the basemap charts. For reference, this is the Humminbird fish finder part number 410950-1. It’s also referred to as Humminbird HELIX 7 CHIRP MSI GPS G3. The HELIX 7 CHIRP Mega SI GPS G3 has three types of sonar, these being Dual Spectrum CHIRP (2D) for traditional scanning, and Down Imaging / Side Imaging for structure scanning and sonar imaging that is close to the clarity of photography. For Dual Spectrum CHIRP, three modes are available; these are Wide Mode (140-200 kHz), Narrow Mode (180-240 kHz), and Full Mode (150-220 kHz). The Wide and Narrow modes are fixed, but if you’re using the Full Mode, you can adjust the CHIRP interval. For Side Imaging, there are two modes available; these are regular Side Imaging at 455 kHz (440-500 kHz) or Mega Side Imaging at (1075-1150 kHz). For Down Imaging, the unit uses the same frequencies, 455 kHz (440-500 kHz) for regular Down Imaging, and (1075-1150 kHz) for Mega Down Imaging. This Humminbird fish finder includes the new XNT 9 HW MSI 150 T transducer. It features a transom mount, it has 20 ft (6 m) of cable and integrates a temperature sensor. This transducer backs all the sonar modes mentioned above. It’s basically a High Wide CHIRP transducer when it comes to the 2D sonar, but also supports Mega DI and Mega SI. For Dual Spectrum CHIRP, the transducer uses conical beams. Their coverage is 25° for Narrow Mode, and 42° for Wide and Full modes. Its maximum depth capability is 1,200 ft (365 m), when using the Wide Mode. However, if the unit is paired with a 50 kHz CHIRP transducer, it should be able to scan depths up to 3,500 ft (1,066 m). This unit does not support 360 Imaging sonar, though, since it does not support Ethernet. For Side Imaging, the transducer uses thin beams with a coverage of approx. 86°; they can extend up to 240 ft (73 m) on each side (480 ft in total) when using regular SI mode, and up to 125 ft (38 m) on each side (250 ft in total) when using Mega SI. 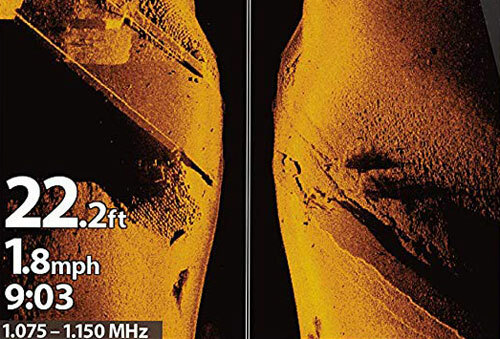 For Down Imaging, the transducer also uses thin beams, but they scan directly under the boat, not on the sides. Their coverage is 75° for both regular DI and Mega DI. However, the depth capability of the Down Imaging mode isn’t as great as for the XNT 9 HW MDI 75 T which is included with the HELIX 7 CHIRP Mega DI GPS G3. Just as for Side Imaging, it can only reach 125 ft (38 m) when using regular DI, and 75 ft (22 m) when using Mega DI. The unit offers a wide array of standard sonar features. 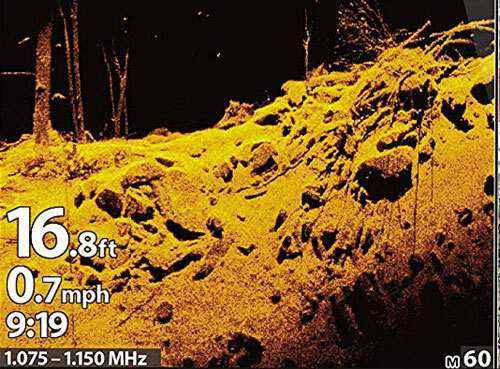 It has the SwitchFire for adding or removing detail, Selective Fish ID for replacing fish arches with fish icons, Real Time Sonar, Bottom Lock, Depth Alarm, Fish Alarm, Sonar Recording, Sonar Snapshot, and more. As its name suggests, this HELIX G3 unit is equipped with an internal GPS receiver. It can provide position enhancements via WAAS, MSAS, and EGNOS. It also offers a GPS Speed function. It can store up to 2,750 waypoints in its memory and has a fairly decent icon palette for waypoint creation, so you can personalize your maps better. Track plotting and route creation functions are also available. The unit can save up to 50 tracks and up to 45 routes. The unit’s internal map database is the Humminbird Basemap. These charts offer considerably more detail than the older UniMap and ContourXD which were built-in the first HELIX units, such as the HELIX 5 SI GPS. They cover more than 10,000 U.S. lakes with 1 ft depth contours and various points of interests. They also offer coverage for the coastal waters, showing, markers, buoys, marinas, hazards, navigation aids and much more. Nonetheless, the HELIX 7 CHIRP MSI GPS G3 is compatible with various superior charts. For example, you can always upgrade to Navionics+, Navionics Platinum+, LakeMaster, LakeMaster Plus. It also supports SmartStrike fishing charts. The unit also offers chart creation and customization possibilities via AutoChart Live. This feature is similar to the Navionics SonarChart feature. It allows you to map your lake as you sail your boat revealing depth contours, reefs, humps, holes, wrecks and other structure, all in real time, based on the 2D sonar and GPS information. 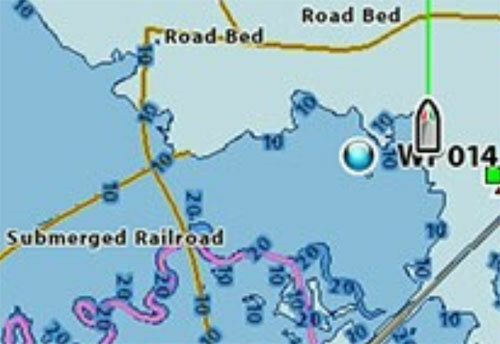 Therefore, if your current maps do not offer satisfying depth contour information, you can always remap a body of water and get the most up to date contours. In terms of other navigation capabilities, this Humminbird HELIX unit supports AIS data and external GPS heading sensors. However, since it’s a G3 unit and not a G3N, it does not support Ethernet or NMEA 2000, and therefore, it does not support Radar or i-Pilot Link. 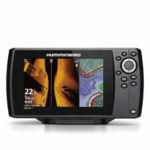 The Humminbird HELIX 7 CHIRP Mega SI GPS G3 features an LCD display, 7″ in diagonal with a pixel resolution of 800H x 480V. Evidently, it’s a color display, with a 16-bit color range, WVGA type. It has LED backlight and provides excellent readability in direct sunlight and from sharp angles (~70°). The unit is keypad operated; it does not have cross-touch technology like the SOLIX 10 CHIRP Mega SI GPS, for example. It also does not have Bluetooth technology and is not compatible with the RC2 remote control. The unit is IPX7 waterproof rated. This means it can support incidental water exposure such as splashes or rain, and even full immersions in freshwater up to 1 meter. Since it’s a G3 unit and not a G3N, it does not support Ethernet or NMEA 2000. It has three connectors, one for the power cable, one for the transducer, and one for the communications cable (NMEA 0183). It also has a microSD card reader with one slot. Therefore, you can add a microSD card with better charts, or update the unit’s internal software via data microSD card. The classic Gimbal mount is included with the unit. However, an in-dash mounting kit is also optionally available. A unit cover is not included. A unit cover is not included. The Humminbird HELIX 7 CHIRP Mega SI GPS G3 is a fish finder and chartplotter featuring Dual Spectrum CHIRP, Mega Si, and Mega DI sonar, GPS, the Humminbird Basemap charts, and AutoChart Live. It also includes the standard XNT 9 HW MSI 150 T. It’s a mid-range fish finder and chartplotter, great for a wide array of boats, for both freshwater and saltwater.